Do you get overwhelmed with trying to pick a nail polish? Nail polish comes in every possible color and style. There are a variety of finishes you can choose from, with each creating a different look for you. Your manicurist will be able to give you suggestions, but the following information will help you to be prepared for your next appointment. Matte finish has a flat color with a subtle shine. There are other formulas made to have extra shine, so that your nails look as if they are still wet. Cream finishes have a shimmer look to them. Metallic or Chrome finish is a very popular type of polish. You might try this type of you are looking for a trendy look. Enhancing finish can help your nails, especially if you have weak or brittle nails. Ask your manicurist for a strengthening formula that will promote nail growth. 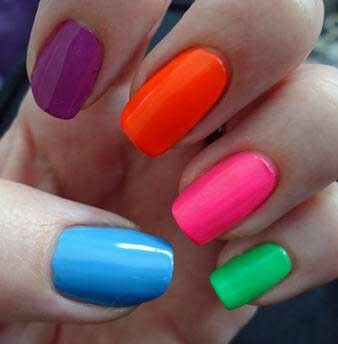 This type of nail polish can help prevent nails from splitting or chipping, so you can have longer nails. Typical growth enhancing nail polish contains strengthening fibers and proteins to promote healthy nail growth. Long Lasting nail polish can ensure your manicure lasts longer, a week or more. To enhance the effectiveness of this type of polish, your manicurist will apply the polish to the tips of your nails as well as the tops and will then finish with a topcoat. Quick Drying nail polish will be dry to the touch by the time your manicurist is finished painting your other hand. You should still wait about 15 minutes for it to dry completely before leaving the salon. All In One Nail Polish. Sometimes we can be in a hurry, and might even encourage our manicurist to use an all-in-one nail polish, a formulation that contains both a base and a topcoat so that it can be painted right on your bare nails and you can be on your way. However, listen to your manicurist and get the best service for your nails and your needs.